Forklifts are notorious for creating shadows right where you are trying to work. 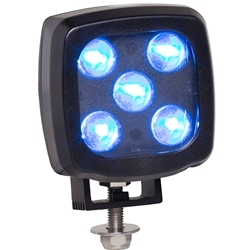 Use this spot light to both see where you are placing your load and to warn pedestrians of the operating machinery. This small, 5 LED spotlight provides 400 lumens of light; just enough to light your way without blinding approaching pedestrians. It works independently from audible alarms and can be used for both forward or rear directional use. Please allow for an additional 3 - 5 business day processing time on this item.